The real work of art worth the best world-known galleries is Da Vinci Diamonds Slot Machine – both a free play and real money slot machine game. It’s launched by International Game Technology (IGT) which is developer of the free IGT slots with no download and registration needed. It was originally created for the real – life casinos to make a slot machine online version. Davinci Diamonds free slots are popular in Canada, Norway, United Kingdom and Australia due to 94.93% RTP, no download instant play and for extra fast and usable mobile version. This slot is often confused with the free Triple Diamond slot as both are jewel-themed with jackpot and free spins. The Da Vinci Diamonds free online slots contain 5 reels and 20 lines. To win, find minimum 3 matching symbols on a payline. Payline value can’t be changed regardless the coin value – between 1.00 and 50.00. Chances for a higher profit are significantly increased due to the exclusive “Tumbling Reels” feature. This slot machine offers you more chances to win in one round. It is activated after you have already landed a winning combination. When it activates, the symbols disappear, and those fields are now replaced with the “tumbling” ones. This process can be repeated on and on, if you continue to get the right combinations. Theoretically, you could win infinite times on a single spin. Note: Be careful when playing demo version – 1000 coins could be lost in only one spin, if your value in the bet line is set up at 50.00. Practice for free, and you can try your luck with the real version! Line wins pay left to right. Line wins multiplied by line bet. 3 on reels 1, 2, and 3 of a played line trigger the Free Spins Bonus, and award 6 free spins. Any 5 award 6, 8, 10, 12 or 15 additional free spins. Any 4 award 4, 6, 8 or 10 additional free spins. Any 3 award 2, 3 or 4 extra free spins. Scatter, Wild and Bonus features, extra spins, and an exclusive feature are all helping you out to increase your price, so the winning chances are extremely big. Keep the values at maximum, for greater winning odds. There are 11 symbols. They values are different but high. The highest payout to gain on a single round is 5,000 coins, and you can win them if you land in the free slot machine of 5 Da Vinci Diamonds logo symbol on a single line. The last 4 are appearing only on the free spins. There are 3 different scatters with the frame around their picture. Scatters don’t need to be on a line in order to award you with some additional coins. They don’t award with extra spins, but there are already too many bonuses involved. As the Da Vinci Diamonds free slot game has a great Tumbling Reels bonus. There are also Wild symbol, and the Bonus features. The colorful Wild card says a “wild” on it. It is used as a substitute for all of the symbols, except the 3 Scatter ones. Receive 25,000 coins if you land 5 of them. Bonus is shown as a “bonus” card, and it gives you a chance of winning bonus spins — try to play this slot machine for free & for real money. You can see it only on the first, second and third reel. Three of those grant you with the modest 6 free spins, but you can win up to 300 during one round. The IGT game of 20 paylines and 5 reels, bonus rounds, 11 Scatters and Wilds so if you want more paylines – try the free Buffalo slot machine game by Aristocrat. with There is no multiplying; you can only receive new coins. By clicking on the “auto spin” option the computer will play the round for you. Mobile version is available with Adobe Flash Player for IOS, Android and Blackberry. The minimum coin size is 1 while the maximum is 100, and you can only set 1 coin per line. It has a massive 5000 jackpot which can make you rich in an instant. The RTP (return to player) rate is about 94.94% which indicates how high your chances of winning are. Hence, if you haven’t tried this game yet, then it is certainly the time to try it out. Play Da Vinci Diamond online free slots no download no registration as they are completely compatible with mobile devices running on Windows, Android, and iOS platforms. The game has been built to adapt to small screens. To ensure the smooth running of the mobile app, install Adobe Flash Player or go for the HTML 5 version of the game. Line bet – use the (-) and (+) symbols to adjust the bet amount for each pay line. The minus (-) icon decreases the bet while the plus (+) increases it. Lines – use the (-) and (+) icons to select the number of pay lines to activate out of the 20 provided pay lines once you’ve set the wager amount. The (-) symbol decreases the number of pay lines while the (+) symbol increases them. Spin – click on the SPIN button to start spinning the reels. Tumbling reels is this game’s most unique feature. It’s activated when a player hits a winning combination during a regular or free spin bonus play. All icons that form the winning are taken out, and the ones above them tumble down to replace them. This happens until there are no more winning combinations being formed. The winning combo symbols are added to the ‘WIN’ window. How to Win Free Da Vinci Diamond Slot Games? 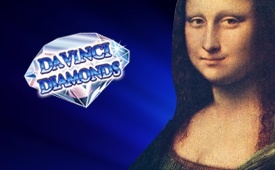 Da Vinci Diamonds free slot game has a simple game play. Set the coin size using the Line Bet plus or minus symbols on the screen. Spin the reels and reveal your winnings. Auto Spin feature which enables you to continuously whirl the reels uninterruptedly for a certain selected number of times. Play for real money in the most online casinos worldwide; the money is normally deposited easily through your credit cards, debit cards or eWallets. Most are accepted across a number of casinos; therefore you will always find a convenient one. What are the Bonuses and Features? Pink diamond is the wild symbol, and it has the world Wild imprinted all over it. It can replace all other symbols except the bonus and scatter symbols. 3 scatter symbols which are cool paintings of various ladies. Each forms a scatter win which is multiplied with your stake amount. You directly get the highest one if you hit more than one scatter win. There is also a Bonus symbol and two unique features: Free Spins and Tumbling Reels. The Tumbling Reels enables you to get new winning pay lines since when you get a win, the symbols vanish, and new ones emerge to fill in the gaps. The Free Spins feature is triggered when you hit the bonus symbols on the first, second or third reel. You first get six spins, and the feature can be activated again and again until the max of 300 spins. These are the features of the Da Vinci Diamonds slot machine — one of the best online casino games and it could be surpassed only with the Double Diamond slots unique due to its 30 paylines, free spins and bonus games. Do not forget – all online slot machines on our website are absolutely free and couls be played with no download and registration needed. The Da Vinci Diamonds casino machine is a low to medium variance slot that offers lots of chances to win big, but also to lose wagered money in just a few spins. Low volatility machines allow gamers to risk more and play aggressively — the free Da Vinci Diamonds slot game is created for this. To collect big cash prizes, do it with low-risk possibilities to lose all of the wagered money. The minimum amount of cash that can be placed is 0.01 coins for a single round. Strategy. When playing the free Da Vinci Diamonds slot game, the best strategy of scoring is to play longer with in-game bonuses, like a free spinning feature. Enter the favorite online casino and start playing for real money with free spins no deposit bonuses. Welcome Bonus. Players can check out the Slotty Vegas gaming site and check out a big welcome offer. Win up to 500$ just for registering and depositing real money. For the first deposit bettors will also get 50 free spins. The wagering conditions should be fulfilled. Terms. Reading the basic terms and conditions is necessary. To place real money stakes in the Da Vinci Diamonds slot, a player must be over 18 years old and gambling should be authorities in your country. After a gambler gets starting bonus, he/she can use it to check out this pokie. Use free spins and extra promotion to boost your account maximally. For the first depositors at the Slotty Vegas casino is to turn the free Davinci Diamond slot games and adjust the wager to the highest amount. This is a money that a player gained for free and it’s good strategy when chasing big jackpot outcomes. This gaming machine has a fair system infused with it so all players will have equal winning opportunities. Previous payouts will have no influence on future wins including parameters like the day of a week, gaming hours, stakes, budget and other.